A NEW MILLENNIUM -- SO WHAT! Archery has seen at least a dozen millennia come and go. And all the while feathers have been an important part of archery. In fact feathers have been the "high tech" arrow guidance system from the "stone age" through the "space age". Forget about Y2K compatible... Trueflight Feathers are Y3K compatible -- and in Y3K might very well still be the lightest, most efficient arrow guidance system ever used. The future of archery? Well, the Encyclopedia Britianica calls the bow and arrow one of humanity's 3 most significant inventions. It's hard to think of any sport with that kind of history. Long term, archery will be around for about as long as human beings survive. Lately archery has not been booming. But despite obstacles, people continue to discover bowhunting. 3D Shooting continues to be an interesting challenge. A wide variety of different types of archery are available... everything from computer video shooting ranges to Olympic field tournaments to back yard "stump shooting". Yes, we are in the age of "high tech" and everything is micro chip this and virtual that. But would you believe that recently 3 of the top 10 computer games have been bowhunting games? It is striking that the bow and arrow can be considered humanity's first "high tech" inventions. It seems that the more "advanced" we become, the more interesting it is to reach back and experience technology's ancient roots. The path to the internet, the path to today's technology begins somewhere back with the invention of archery. At Trueflight, we're proud to be doing our small part in today's archery. Feather fletching has a long history. In the 21st century, Trueflight Feathers are still number 1 in arrow guidance. We've known for years that a feather's web is made up of many individual curved segments. These segments are hinged at the bottom where they attach to the solid quill. This allows the segments to fold down on contact with an arrow rest or other obstruction, then pop right back up again. At the same time, these segments form a surface which strongly resists sideways forces such as the aerodynamic force which keeps an arrow flying straight. In order to do this, the web segments are joined to each other by a very clever and flexible system of fibers. 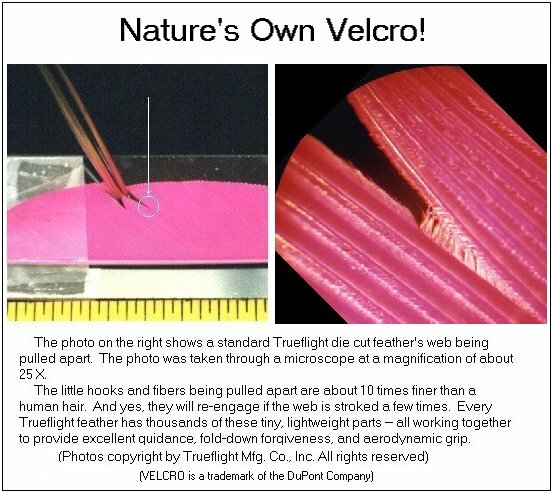 We've called this system of fibers, "Nature's Own Velcro", since they can unzip and re-close just like man made Velcro. I used to think of these fibers as a sort of random "fuzz" growing on each segment. But a look through a microscope shows there is nothing "random" about that fuzz -- and it isn't fuzz! Each of those web segments has a single precise row of tiny hooks and a single row of thin fibers. The hooks from one segment slide neatly into the fibers from the next segment. It's hard to imagine a more efficient or elegant system. And the size of those hooks and fibers is amazing. Each is about 10 times finer than a human hair, and about 30 times finer than the "hooks" in man made Velcro. Even more surprising, the hooks and fibers and even the curved web segments aren't a solid material -- they're filled with thousands of microscopic air cells. Talk about high tech... under the microscope feathers look like they were made form the latest aerospace honeycomb panels. The "solid" quill at the base of the feather, too, is actually made up of thousands of honeycomb air cells. No wonder feather fletchings weigh only about 3 grains each -- they're about 80% empty air cells! It's difficult to conceive of a man made fletching with as much fine detail and efficient design as feather fletching. Mother Nature has done some incredible engineering in feathers -- and that engineering is done down to microscopic sizes. I'm more convinced than ever that the most sophisticated, complex and "high tech" part of an archer's equipment is the natural feather fletching on the arrows. Every feather has hundreds of web segments, thousands of hooks and fibers, and tens of thousands of air cells, all so tiny and detailed that we don't even notice them without a microscope! We're proud to announce that our own Bob Link, Trueflight's General Manager and Vice President has been elected to the board of directors of the Wisconsin Bowhunters. The Wisconsin Bowhunters is one of the oldest state bowhunting organizations. Over the years, the organization has been in the lead in establishing archery seasons and regulations. B. C. Roemer, Trueflight's founder and President has been a Wisconsin Bowhunters member and supporter for over 50 years. We are particularly happy to see Bob on the Wisconsin Bowhunters board. Like most bowhunters, Bob hunts on weekends and around his work and family schedule. We're sure Bob's input as a "real world bowhunter" will be valuable to all Wisconsin Bowhunters. That's right, we have a new web site packed with information on arrow fletching and Trueflight Feathers. This may be a record -- an 11,000 year old product on the latest "high tech medium". Well, feathers are high tech! Our web site ( http://www.trueflightfeathers.com) includes our "Fletching Guide" and "Feather Facts" brochures (with improvements) along with our newsletters. All or our colors and shapes, as well as examples of fletched arrows are also shown. But we don't sell anything on the web site. We are strictly promoting feathers and giving fletching advice. Anyone wanting to buy feathers is strongly urged to visit their local archery dealer. SO WHAT THE HECK IS THE INTERNET, ANYWAY? Good question -- with all the hype going around, you'd think the Internet was a magic cure-all for all the world's problems. Well, not quite. The Internet is actually a simple idea. You can think of it as being analogous to making a long distance phone call. You pick up the receiver, dial the number, then talk (ie. exchange information) with the person on the other end of the line. On the Internet, your computer uses the same phone lines to call some other computer, exchanging "information" with that computer. The "information" can be text, pictures, even sound and video clips. Because the information is sent in short bursts on "space available" lines, the costs are quite low. Who provides the "information" on the Internet? Anyone, anywhere in the world, willing to pay a small monthly fee. Who regulates the "information" that is provided? Isn't the Internet like a big encyclopedia of all the world's knowledge? Absolutely not. There may be some good educational "information" available, but there is also an abundance of misinformation, biased information, criminal information, insane information, and obscene information -- all just a few seconds away. The best way to think of the stuff on the Internet is as being, "promotional brochures". We have found the Internet particularly useful as a quick, convenient way of getting product information. As long as you keep in mind the unregulated nature of the information, the Internet can be very useful. Should children be allowed to use the Internet without adult supervision? My opinion is, NO WAY! Most parents wouldn't give their children unsupervised access to make telephone calls to anyone they want -- the same should be true of the Internet. What do I need to use the Internet? Presently computers suitable for use with the Internet are priced around $500 to $800. (And the prices are continuing to drop.) You will also need to pay a monthly fee to an Internet Service Provider (ISP). This fee is typically $20 per month for unlimited use, or $10 per month for 10 hours per month. Do I need to take a computer course to learn how to use the blamed thing? Probably not. If you ask a friend or neighbor who is already using the Internet, they almost certainly will be very happy to "show you the ropes". (Ideally, find a 10 year old kid with thick glasses -- often the best experts. Provide pizza and pop.) Using the Internet isn't at all hard once you have gotten started. Often a little "trial and error" will solve any problems. And no, you do not need to know how to type. Once again this year millions of feathers were processed at our busy feather factory -- the starting point of being the finishing touch on millions of your beautiful arrows. We are always overwhelmed at the trade Show to see so many gorgeous arrows on display. You folks really do a great job of taking all the arrow components and making outstanding,"traffic stopping" arrows. We are very fortunate to have the hard working employee's we do. They thoroughly understand what our customers want and they do their best to fulfill that need. For example a Grinder operator, picking feathers for a select Full Length order will sometimes go through about 2 large 30 lbs boxes or 12,000 feathers to get 1000 select ones. Die Cut operators who do the finish work cutting the various sizes and shapes will go through a ground box of 6000 feathers to get about 4000 4" or 5" cuts. The length is the big thing, if the feathers are not long enough for 5" they will be put down for a 4" cut. Our people as you can see handle several feathers before they find the ones that are acceptable to our standards. This year we've had two of our treasured employee's retire after 20 years of service. Auther Washa, was our Dye Master, responsible for the creating all the beautiful colors on our feathers. He also was involved in the production of our Trueflight Barred. Carol Brunner, after 18 years of service is also retiring. She was one of our finest dye cut operators for many years. We figured Carol cut about 30 million feathers while in the Die Cut Department before she transferred to our Drying Department. We were really blessed to have two such loyal hard working employee's -- without a doubt they will be missed around here. I'm very happy for both as they are truly enjoying their retirements. This past July I was able to obtain A.M.O. Archery Alley for our church's annual Summerfest. Our Pastor, Fr. Jim was open minded to the idea of introducing the youth of our area to the sport of Archery. The A.M.O Archery Alley provided our kids with a fun filled learning experience. It worked out better than we ever expected for many young children. For the majority of the kids this was the first time that they ever shot a bow and arrow. I opened the alley at 10.00 A.M. and worked almost nonstop until 8:00 P.M. Adding balloons to each of the targets plates proved to add even more fun. I was also very pleased to see the ratio of girls to boys was almost equal. Many parents were very impressed with how fast their sons & daughters caught on. Our only hope is that the kids will continue to pursue this wonderful sport of ours. If you are interested in using an Archery Alley they can be obtained from one of several major Distributors. You can also call the A.M.O. office in Gainesville, Fl. (352-377-8262) for further informations. There is no fee except for the shipping of the two large cases, unless you are an AMO member -- then the shipping is free. This year I was very pleased that I was able to convince Wisconsin Bowhunters our state Bowhunting organization, to purchase an Archery Alley. What a positive way to reach our to many kids who have no idea what shooting a bow and arrow is all about. I've talked to one of our local dealers and he would like to use the Archery Alley at a home and camping show which is held at our High School Gyms. The Archery Alley can be also be used inside or outside and it is not necessary to use it just at Archery functions. I was fortunate to draw a Wisconsin Bear harvest permit this year. I started baiting on July 18th and things got off to a very good start as I had three very active stations. However, I soon found out that competing with the Hound hunters can make a bear become very nocturnal and erratic. On top of that Wisconsin had a bumper crop of blueberries, rasberries and acorns not to mention a ton of dogwood. Enough with the excuses. Actually half the fun of bear baiting is the routine baiting. Most of my hauling was within miles of my work so leaving my house by 5:00 A.M. each morning would usually give me enough time to check and refill stations before work. My 1st & 2nd stations required me to use my mountain bike to travel about a mile down a rough path. Bait was carried in a large backpack. When filling stations I was very thankful for two things -- one that no one ever seen this "polish bowhunter" traveling on a mountain bike with a large backpack and his swampers on, and two that a bear never got me! My morning baiting adventures resulted in seeing 4 different bears, which was really exciting. It will take me another 7 to 8 years to get another harvest permit. I really don't think I'll be using my mountain bike then. Oh! I should of explained that in Wisconsin on State owned land it is unlawful to use a four- wheeler. It wouldn't of mattered I don't have one anyways. I should mention that my nine year old son, Jacob helped his dad set up those stations and refill them on weekends. You should of seen his face light up everytime that he seen the bait was hit. My biggest disappointment was not getting a bear for him. Of course, you and I know that we don't bowhunt because we are always certain of success, even when you put in a lot of work. Well, despite not getting that illusive Black Bear trophy, we did salvage a first place trophy for my sons little league team which I coached. There were times that I felt much safer dealing with the Black bears instead of some parents on the team. Placing 2nd in Northwoods Musky Tournament was not so bad either -- thanks mostly to my son who caught and release a 40" musky. The short story is that Jacob's dad did not set fast enough on a couple of Musky that hit on my surface bait, but on the final day of this tournament with less than 15 minutes left I got a ripping hit on a deep running bait called a "Five of Diamonds." My musky pole bent down like I never seen it bend before. Time was running out and I was sure that I could get this fish in we would certainly have first place "locked up". Finally, that Musky of a lifetime was on!. Can you imagine how I felt when I finally got this fish to the surface and see that my trophy musky turned out to be thirty pound catfish. A couple of quick pictures and the fish was released back into the depths of Round Lake. When all was done we ended up in 2nd place and each received a beautiful trophy wood carving of a musky and a musky rod and reel. Thanks again to my best buddy. Thank you for letting me share some of this summers special blessing I had with you. On behalf of all of us here at Trueflight we would like to Thank you from the bottoms of our hearts for you continued support over the past year. We also hope that your Holidays and the New Year will be a Blessed one. Trueflight Mfg. Co. was started in 1946. We were planning on going into the arrow-bow business. Building arrows seem the easiest way to start so we developed equipment to make the shafts etc. Back then you couldn't buy ready made shafts which were all wood, of course. Feather were a problem -- you just couldn't get any so we had to develop our own grinding machine. Once this was done (after a few years work) other arrow makers heard about us they all wanted feathers. To supply the demand required more machines and we never did get to make arrows or bows. We published our first price sheet April 23, 1948. We were the first to offer "Cut to Length" feathers pieces. We were the first to develop Die Cut to shape machines. We were the first to ship feathers over seas. We have produced about 1 Billion Feathers! We are environmentally friendly with oversight of the EPA, OSHA, etc. with all our processing and wash & dyeing. Now one might think that our feathers are more expensive than feathers processed in Mexico as is our competition. -- and you would be correct. Head - $10.00 Shaft - $5.00 $15.00 Trueflight Feathers would add .33 cents to this arrow, over vanes but only about .05 cents over other competitors feathers. Regardless of how much more you might pay for the heads better shaft, etc. they are all worthless without the best guidance available - Trueflight Feathers. Our feathers are about 2% of the total cost of an arrow. And almost an infinitesimal cost of a hunting trip. If you feel they are too expensive we can only suggest you buy the Mexico made ones. (we could match their price with the lesser of our quality and your success or expectation but won't!) Naturally, we wish to sell you our feathers -- we have a wall full of success pictures our feathers have produced and we would like your picture framed also. It all comes down to guidance. The preparation for the hunt - the miles travels, the walk - the hours in the tree stand -and then the shot! All depended on guidance -- Trueflight's philosophy for over 50 years has been to produced the best guidance available -- And our lab & research dept. has the in-flight photos to prove it -- but the real proof is your success and millions of fellow bow hunters. As many of you know, our raw feathers are clipped in one's and two's from each wing of domestic U.S. turkeys. Over the years as turkeys were more and more hybrid for fast meat production, it has been more and more difficult to find good strong pointer feathers for archery fletching. Lately another problem has turned up. Labor shortages in the U.S. have made it very hard and expensive to hire people to clip the raw feathers. I'm sure many of you in business in the U.S. know just how hard it is to hire and keep good employees. As a result of these problems, our raw material costs have increased substantially. We feel we simply cannot accept lower quality, marginal feathers as raw material. That would not be good for us or for our customers. Text and Photos copyright 1999, Trueflight Mfg. Co., Inc.